The first time I first saw Shadisha Robinson play, it was at an Eastern Sectional tournament at the Port Washington Tennis Academy. She couldn't have been more than thirteen, but it was obvious even then that she had enough talent to take her to the trophy table. 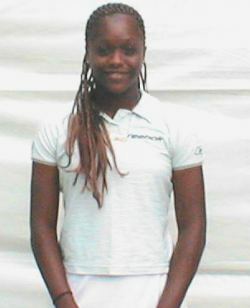 Shadisha's rise to the top began in 1999, the year she won the singles title at the Girls' 14 USTA National Claycourts, as well as the singles and doubles at the Southern Open. That same year she made it to the semis of the Easter Bowl and was a quarterfinalist at the USTA National Hardcourts. From that moment on, Shadisha has continued to place in the final eight of almost every national junior tournament she has entered. She has also won the Kentucky Internationals (2001) and the USTA National Claycourts (2001) doubles crowns with Ally Baker. Since that first meeting Shadisha has grown a lot. She is not just taller, but more confident and mature. She had defeated the No. 5 seeded Mashona Washington at the Apple & Eve LI Tennis Classic (a USTA Pro Circuit event) and was prepared for her next step. Q: Why did you choose to play this tournament (the Apple & Eve) instead of the junior events? A: "I realized there would be no competition -- no one is playing it (the USTA Super National Claycourts)." Q: Why Why do you think that is? A: "I guess people are moving on. They want to play more pros, get their ranking up in the pros."